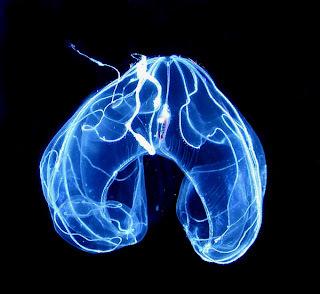 Lobate Ctenophores are Comb Jellies in the order Lobata. They got lobes! These lobes are like huge, muscular lips that extend out from the body and leave the mouth in their ambitious wake. Instead of the long, sticky tentacles trailing behind like a fishing line that other Comb Jellies have, Lobate tentacles are on the inner surface of the lips in grooves that wind around and about. It means that those lips can close around morsels of plankton, trapping them. They can then get caught by the tentacles and moved to the mouth. Some Lobates even have rows of cilia right next to the mouth, which can create a current to direct food right to where it's wanted most. Aside from that, they have the normal 8 rows of cilia beating at extraordinary speed to get them around. But, when predators come a-calling those huge lobes have a whole new purpose for some Lobates. If they're shut with enough speed, a jet of water is released and they'll fly backwards at a pace that must surely be the toast of the jelly world! If you got it, run with it! Looks like something a redneck alien might hang from the tailgate of his pick-up UFO. Haha! I wonder if it smells like pine trees? Or maybe redneck aliens like the smell of toilet or sweat or something. Would you believe me if I said I didn't even notice that? I seem to be getting so cheesy that I don't even notice. At least it makes thing a little easier!